We’d love your help. Let us know what’s wrong with this preview of Milly-Molly-Mandy Again by Joyce Lankester Brisley. To ask other readers questions about Milly-Molly-Mandy Again, please sign up. Just keep getting better, Matilda is going to love these and time with Mum. The maps at the front of the book are the best. The fourth book in the Milly-Molly-Mandy series. These are sweet short stories about the everyday adventures of a little girl living in an English village. Perhaps it's that this book was written in the 1950s and reading tastes had changed, or that MMM is older (perhaps 8 or 9? It's not clear) and now in school, but these stories don't have the same pure innocence of the first book written in the 1920s. There's more conflict (in one story, MMM and her friends deal with a group of bullies) and co The fourth book in the Milly-Molly-Mandy series. These are sweet short stories about the everyday adventures of a little girl living in an English village. Perhaps it's that this book was written in the 1950s and reading tastes had changed, or that MMM is older (perhaps 8 or 9? It's not clear) and now in school, but these stories don't have the same pure innocence of the first book written in the 1920s. There's more conflict (in one story, MMM and her friends deal with a group of bullies) and complexity to the plots. The writing in regard to plot is better, and the stories are still sweet and have a refreshing charm. I wonder if they'd appeal to modern children as bedtime stories or for early readers. While the period is different, to children of today who aren't allowed to wander about on their own (MMM is generally on her own or with her young friends, exploring the woods, going shopping, etc.) I wonder if there would seem to be a quality of adventure of a different sort. 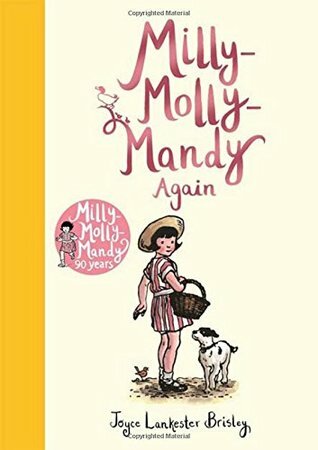 It has a very interesting story.Everyday there is something bad happening to the neighbourhood where Milly-Molly-Mandy lives.She can always solve the problem, but can she always solve things? Joyce Lankester Brisley (6 February 1896 – 1978) was an English writer. She is most noted for writing and illustrating the Milly-Molly-Mandy series, which were first printed in 1925 by the Christian Science Monitor. The second of three daughters of George Brisley, a pharmacist, of Bexhill-on-Sea, Sussex, Brisley's sisters - Ethel Constance, the eldest, and Nina Kennard, the youngest - were also ill Joyce Lankester Brisley (6 February 1896 – 1978) was an English writer. She is most noted for writing and illustrating the Milly-Molly-Mandy series, which were first printed in 1925 by the Christian Science Monitor. The second of three daughters of George Brisley, a pharmacist, of Bexhill-on-Sea, Sussex, Brisley's sisters - Ethel Constance, the eldest, and Nina Kennard, the youngest - were also illustrators. They studied art firstly at Hastings School of Art, then, following their parents' divorce in 1912 and the subsequent relocation of the girls and their father to Brixton, at Lambeth School of Art.